Our PPE recycling for re-use service enables you to save money on replacement costs whilst helping towards environmental KPIs. PPE waste and disposal is a big expense for many companies. 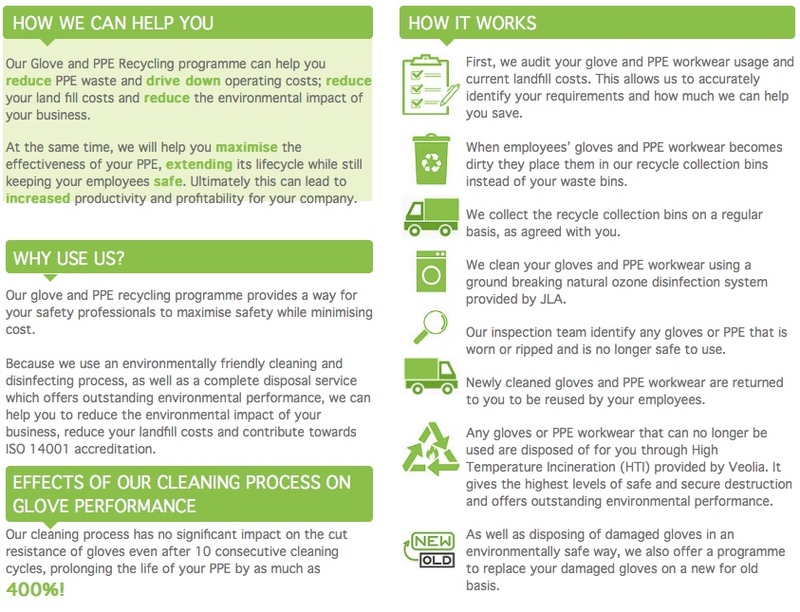 WE CAN REDUCE YOUR ENVIRONMENTAL IMPACT BY PPE AND GLOVE WASHING FOR RE-USE! Oliver Shaw, NPI Buyer, Frank Dudley Ltd.
“With a large workforce using PPE daily comes the growing costs of PPE and the Environmental impact of sending used PPE to landfill, Staysafe have provided us with a solution to this issue. They collect our used PPE gloves and bump hats wash them and return them to us ready to be re used. We have saved approx. £30K in just over 12 months and limited our waste to landfill. Each pair of gloves can be washed and re used approx. 5 times so good for the planet too. Washing uses no harsh chemicals so another bonus”. OUR GLOVE AND PPE WASHING AND DISPOSAL SERVICE can help you to reduce your replacement costs. How? By washing your PPE and laundering and repairing your hi-vis outerwear. This process will save you around 60%. We only charge you for returned items which are fit for purpose, and for HTI waste disposal which is at cost. At STAYSAFE PPE, we operate a nil to landfill policy, so by using our PPE and glove washing service, not only will you extend the life of your PPE, you will also reduce your landfill costs AND therefore your carbon footprint. Because we always wash your gloves and PPE according to manufacturers’ instructions, we guarantee that the performance of your PPE is not affected. Our UKAS laboratory test results prove that the washed gloves and PPE are as clean as brand new ones! As a result, we at Staysafe PPE Ltd, will make it easier for you to achieve environmental accreditations, continuous improvement KPIs, and to reduce costs without compromising on employee safety. You can take the pressure off new budget cost savings by finding out more about our environmentally friendly CLEANING PROCESS. Our zero to landfill DISPOSAL PROCESS saves money too! CALL US NOW ON 01746 781027 TO ARRANGE YOUR FREE TRIAL! Contact us by telephone, email or complete our ‘Contact Us‘ form.